It has been fantastic here during the last couple of weeks. There are have been big storms nearly every day. It’s a such a different place from last year when the rains failed. The whole place is now a brilliant shade of green and there are giant herds of springbok and zebra everywhere. Stopping at a deserted location and watching the storms come is a wonderful feeling. The velds stretch on for as far as the eye can see and one can see storms building and approaching from great distances. While driving back to camp last evening, I saw a storm over the Ondundozonananandana (yeah, I can pronounce it!) hills – the only piece of elevation you get to see in the Okaukuejo area. Storms here are accompanied by unbelievable number of lightning strikes and thunder, and it’s only a matter of time before you can get a photograph of a lighting strike if you wanted one. 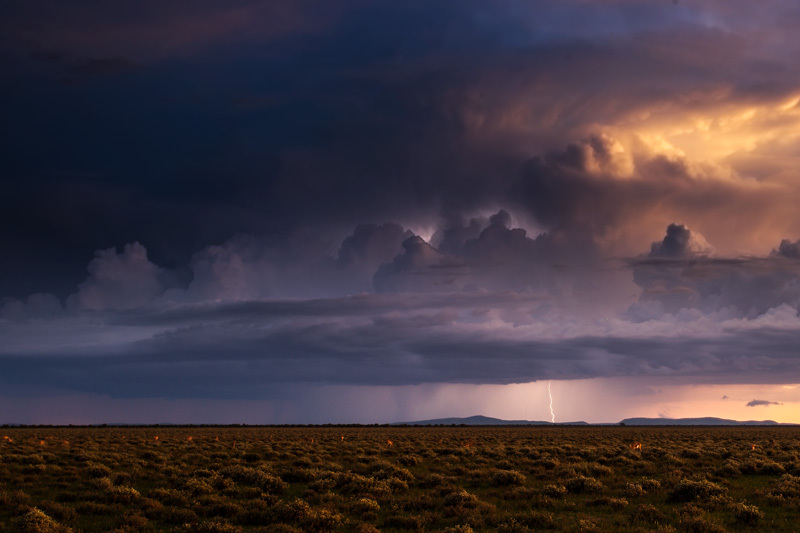 I pulled over next to a herd of springbok and mounted my camera on the car’s window and began clicking away using a remote trigger while I got to experience watching the storm itself. Every few minutes there would be a blinding strike followed by a deafening roll of thunder. The springboks would go about their pronking after each lightning-thunder event! It was quiet magnificent, especially because no one else was around. And the storm was probably more than thirty or so kilometers away. Quite amazing! As the light faded, it was beginning to get even better. Even more spectacular. However, I do not have the permission to stay out of the camp all night and I had to hurry to back in time. As much as I wanted to watch the storm come and hit me with a wall of water, I had to move on. 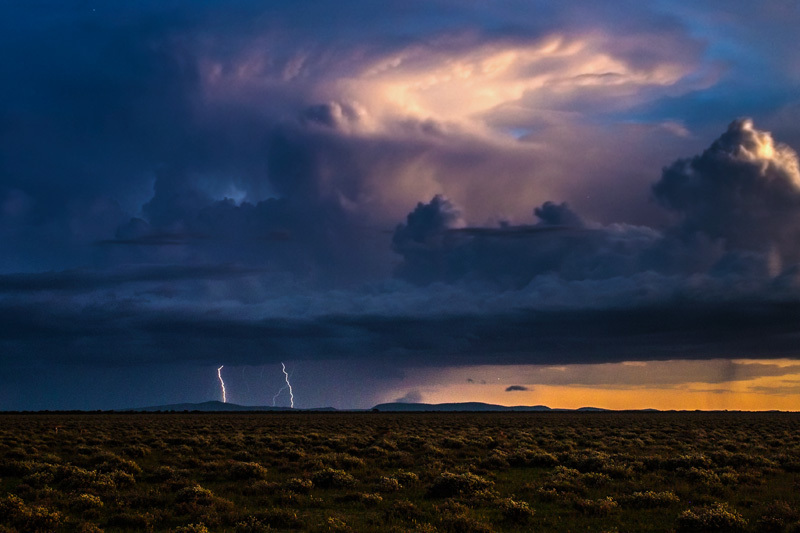 I packed up the cameras and drove toward camp, and the oncoming storm. As soon as I entered the camp, the windscreen tasted the first drops of rain. 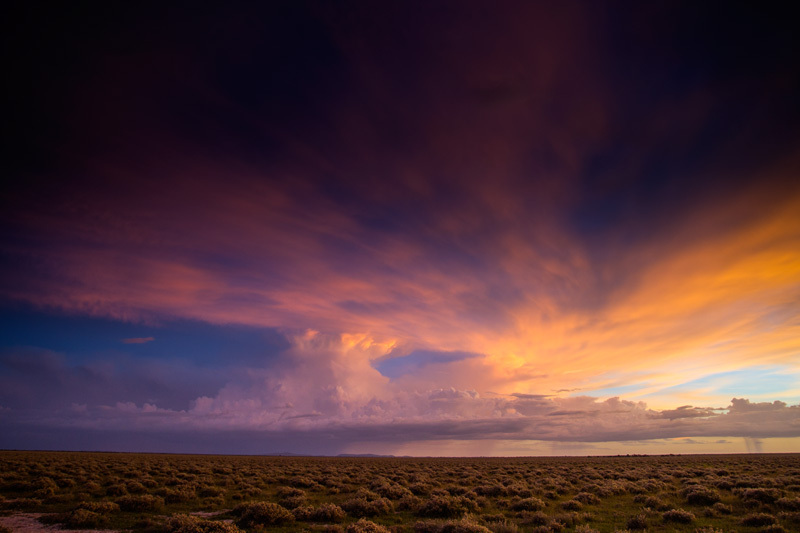 And five minutes later I was in another Etosha storm. I love this place.